In celebration of all the fabulous places to which you can travel with Expedia, they have thrown down the gauntlet and launched a culinary competition – the “World On A Plate Challenge”. Multi toned socks are an integral part of the Roman look apparently. The aim is to try your hand at the local cuisine of one of their package holiday destinations. 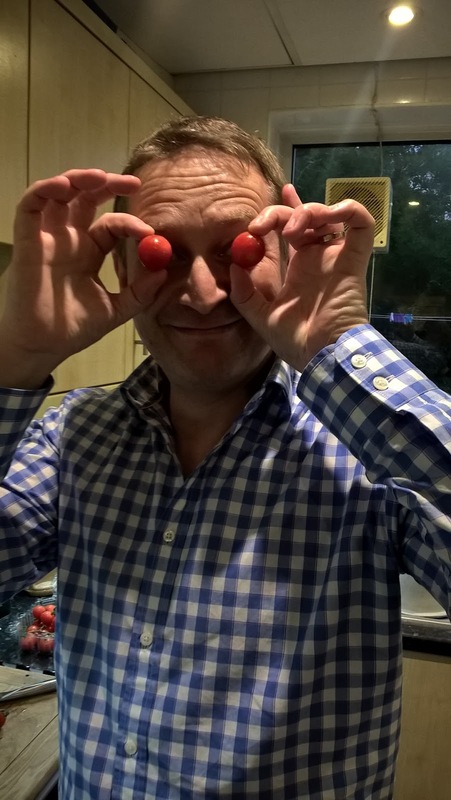 Now, as readers of this blog know, although there’s nothing I can’t do with a baked potato, the kids are, shall we say, ever so slightly discerning when it comes to ‘grown up food’ and Ieuan can take three weeks to finish one mouthful of carrot. 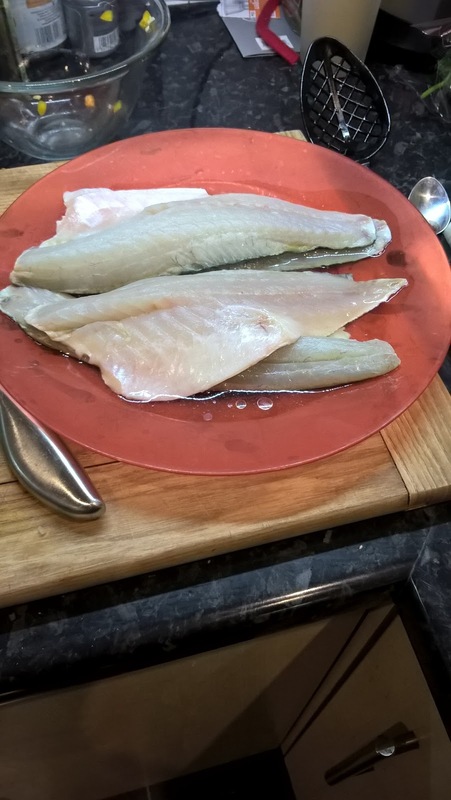 Nevertheless, not daunted by this fact nor by the loving moniker the Husband has given me (“Queen of The Reheat”), we decided to reproduce a beautiful sea bass dish from Italy. I say “we”. Obviously I mean “under maximum supervision by the Husband”. Many years ago, I visited the wonderful city of Rome and then travelled to Amalfi and Portofino. Gazing at Mount Vesuvius across the Bay of Naples is a view that will always stay with me; as will the sheer scale of the Forum and the Colosseum in Rome. And of course, I had to throw the famous “three coins in the fountain” at The Trevi Fountain. It’s only taken me 4 years but I have finally renewed my passport so I can now legally travel further than Devon and as a family we can begin to introduce the kids to the World’s wonders. Part of the charm of Italy, of course, is its food and much has been written about the health giving properties of the Mediterranean diet with its high proportion of fresh fruit and vegetables, fresh fish, olive oil and red wine. Then there is also the legendary Sophia Loren’s claim that “everything you see I owe to spaghetti”. Actually, many of us beleaguered parents owe a debt of immense thanks to pasta as it is frequently one of the few food groups which can be spooned into a protesting child without too many repurcussions. We did, bizarrely, manage to get Ieuan to eat spinach recently when the Husband told him that the role of spinach was to protect carrots and it was also known as “carrot guardian” and had superpowers. Sadly, that moment has never been repeated. 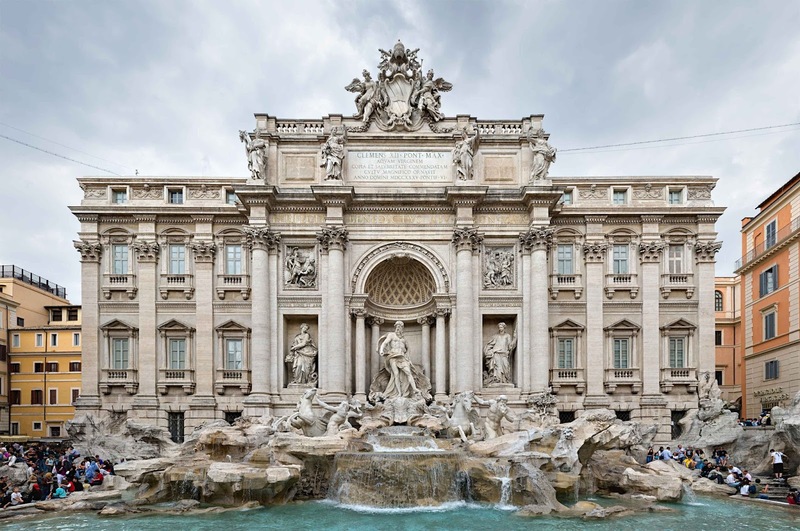 So, to create our homage to the beauty of Italy (with me hinting rather largely that Rome would be such a nice place to be taken for my next birthday, particularly the River Palace Hotel), we began our creation. Since the kids have had pasta twice this week already in their school dinner, we adapted a recipe by Giada De Laurentiis called Sea Bass Alla Fiorentina. You just can’t get the staff, can you? Season both sides of the fish with salt and pepper. Heat the 3 tablespoons olive oil over medium heat in a frying pan and cook the fish until golden brown, about 3 minutes per side. Heat the remaining 3 tablespoons olive oil over medium heat. 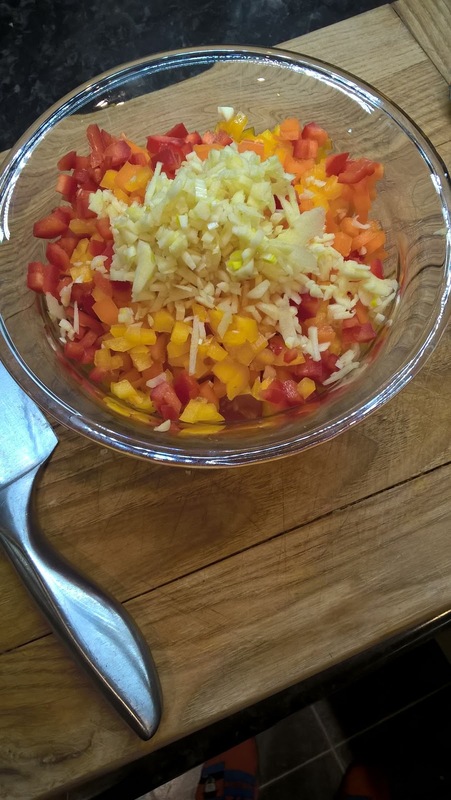 Add the garlic, tomatoes, peppers, 1/4 teaspoon salt, and 1/2 teaspoon pepper and cook at a simmer for 10 minutes. Add the parsley and the fish and heat for 2 minutes. 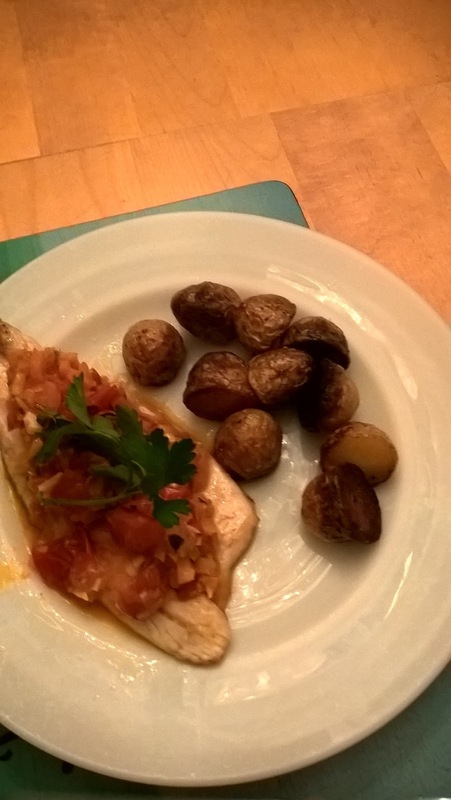 We served the fish with baby potatoes sautéd in olive oil and a heavy dose of optimism. 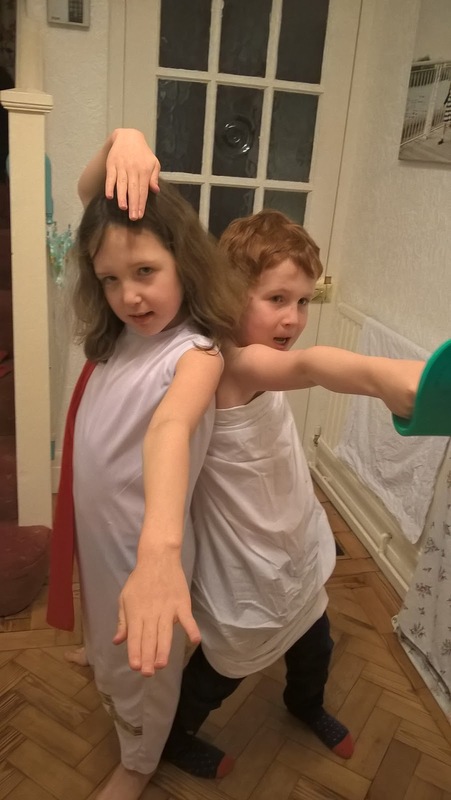 To add to the fun, the kids ‘went Roman’ – although the combination of tomato and bed-sheet is probably not to be recommended. 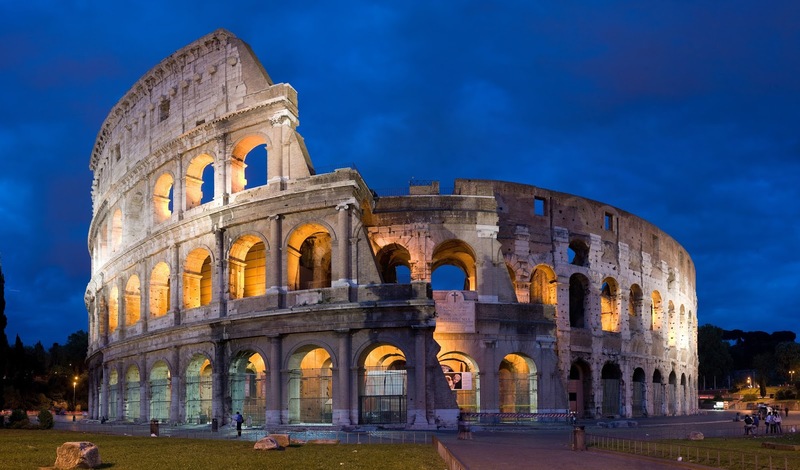 Over dinner, we talked about the ancient Roman civilisation which the kids are currently studying in school. We recently visited the Roman Baths in Bath and Caitlin’s school trip was to the Roman remains in Caerleon. The flavours of Italy never fail to inspire – although the combination of fava beans and a nice Chianti is probably one to be avoided. I’m hoping 2016 will be the year I can revisit Rome. In the meantime, I will channel my inner Sophia and build my strength up with spaghetti. 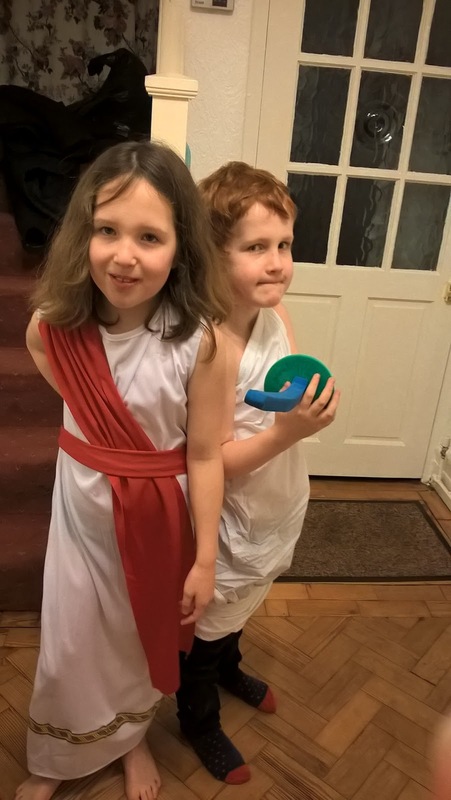 But my chances of getting Ieuan back in a toga are slim. "Festive Outfit Inspiration From Bonprix"
"Do You Know Your Flood Risk? Free downloadable ‘Homeowners Guide to Flood Resilience’ Launched.‏"